Things have been so busy lately for Jeremy and I in between our general working life, plus also planning for his return to uni in the coming weeks for his second degree. So having the Australia Day long weekend roll down was most welcome as we were both eager for some down time to relax. 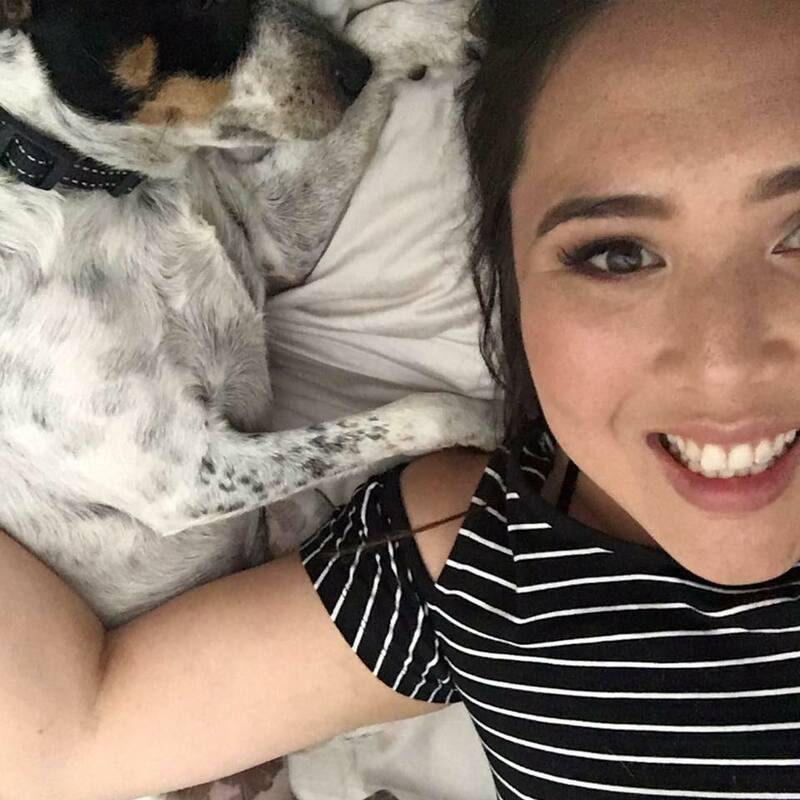 However as with most weekends, we actually ended up having a whole heap of plans between catching up with friends and family. Thankfully on the Saturday night we managed to have a date night, with Jeremy booking us tickets to the Illusionists at Crown Theatre. It was a fantastic show, finishing around 9.30pm – at which point we looked at each other and declared utter starvation. We had initially planned on going for dinner before the show but since it started at 7pm it was just too awkward a time to navigate around. While I considered options to dine at, I found Jeremy walking me towards Rockpool. What a fantastic choice! I’ve eaten there before and really enjoyed it, so I’ve been dying to take him back to try it out. If you haven’t been to Rockpool, entering the restaurant is a grand affair. 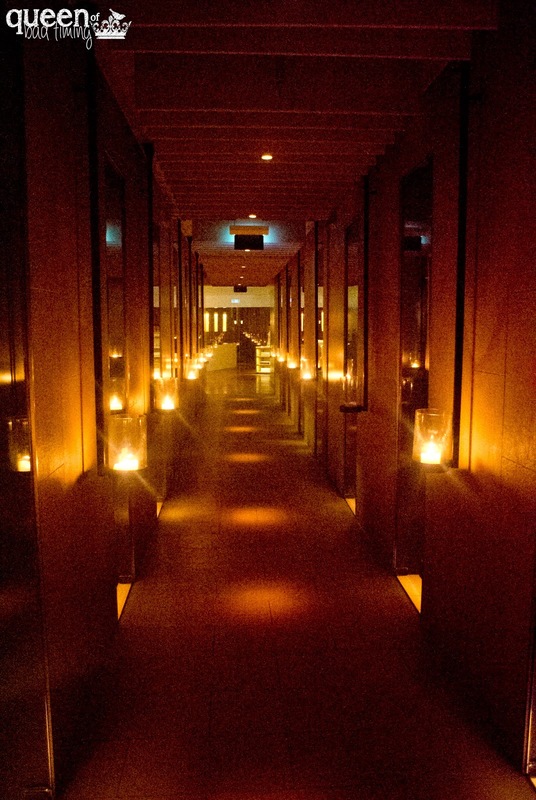 Dark wooden panels line the hallway with candles lighting the way. For the first half the walls house encased artwork, but then as you get closer to the restaurant the left side shows refrigerated chunks of beef awaiting cooking and the other side the extensive wine selection on offer. We enter and assume we’ll only be able to get seats at the bar since we don’t have a reservation, but to my surprise they tell us they have a table ready if we’d like it. Looks like fate has lined up our night perfectly! We’re shown to our table in a dark corner of the restaurant and while it’s a greatly intimate dining space, I know it’s going to be hell on my little Nikon SLR since I hate using flash indoors. The menu at Rockpool is extremely extensive. There’s so many options to choose from especially when it comes to the entree selection – there’s cold, salad, hot and pasta, all with a long list of items. It takes us a bit of time, but eventually we place our orders and are rewarded with a delivery of complimentary bread. Always a good thing! The bread is crunchy and fresh, the butter salty and oh so creamy. Why oh why is butter so damn tasty!! 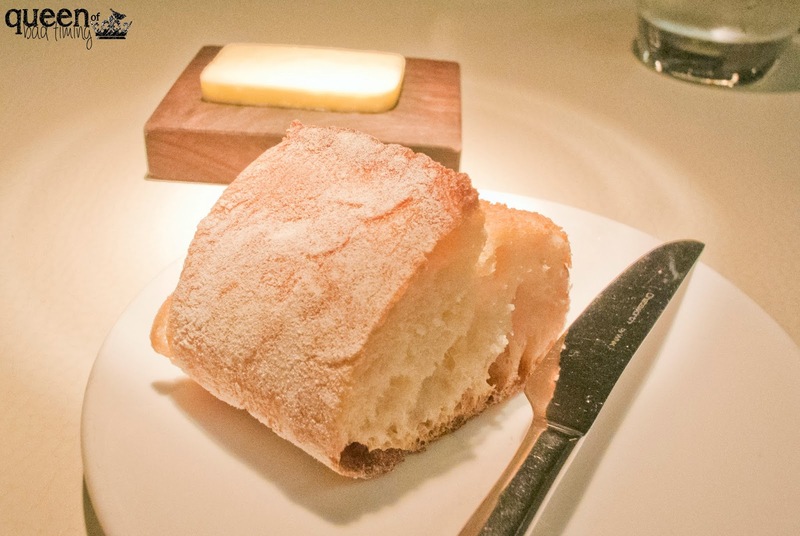 I love that they keep the bread coming here at Rockpool – before I know it we’ve polished off a couple of large pieces each and they were even so kind as to replenish our butter for my sickening addiction. Our entrees come out not long after we’ve polished off our bread. Jeremy’s ordered from the hot selection – the Sauteed White Rocks Veal Sweetbreads with Onions, Dates, Cashews and Coriander ($32). It’s a dish of different shades of brown, but boy did it pack a punch in terms of flavour. 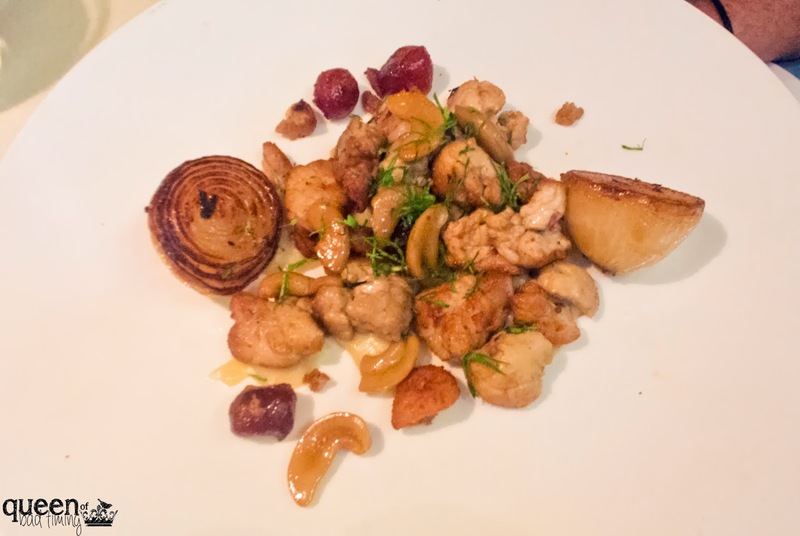 Sweet, pan fried sweetbreads offer a change of pace to your normal deep fried use of this offal. I love the combination with the caramelised onion and crunchy cashew nuts. And I’m pleased to see that my boy is completely taken with it, wolfing it down with an extremely satisfied grin. 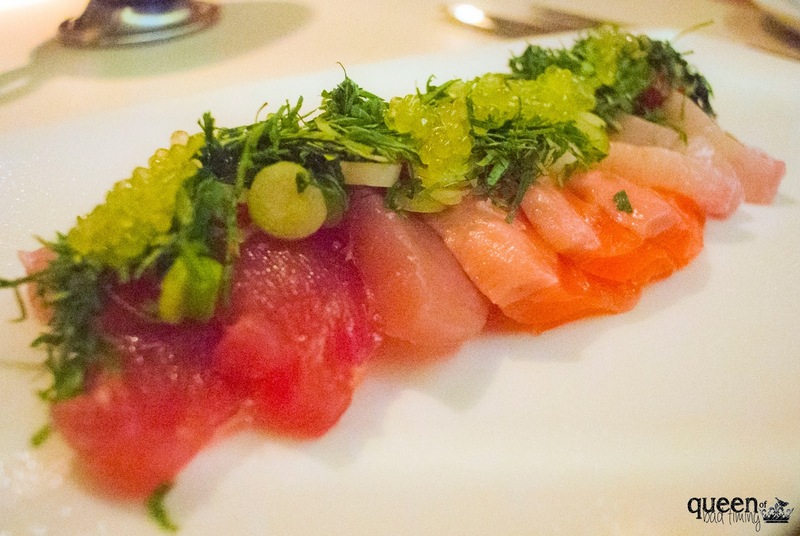 My entree is from the cold choices, the Crudo of Kingfish, Ocean Trout and Yellow Fin Tuna with Coriander and Finger Lime Flavoured Extra Virgin Olive Oil ($32). It comes out looking so amazingly vibrant, with three slices of each fish type – all sliced with precision to the same size and thickness. The coriander, spring onion and finger lime mixture is spread thickly on top, and a silver pouring jug with extra virgin olive oil to pour over the top. The fish is so fresh it tastes just like the ocean. The texture is firm but still tender. 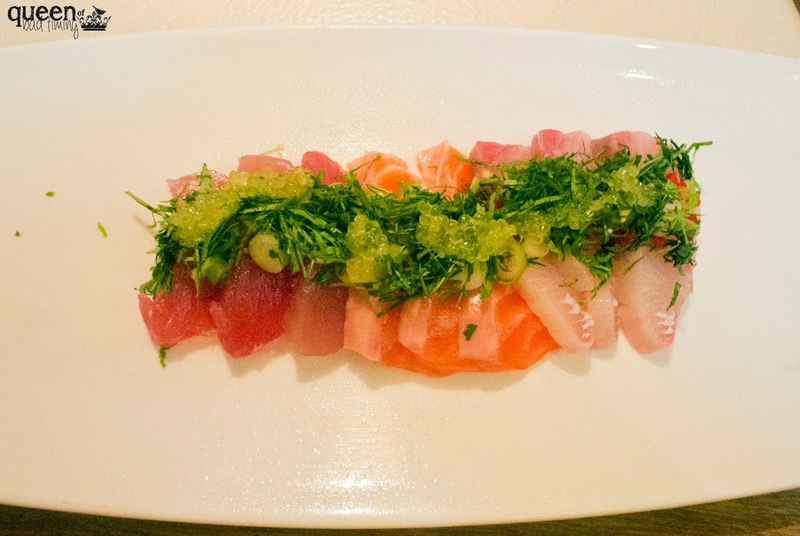 I adore sashimi and this is spot on – the fish shines through and works so well with the punchy topping that is sour from the finger lime and crunchy from the spring onion. A perfect dish in my opinion! I wouldn’t change a thing. Not long after our entrees are cleared, our mains come out to our table on a large silver tray. I love that for each course they set up a table next to your table just to serve you. It makes you feel like so transported, and really underlines Rockpool’s fine dining atmosphere. 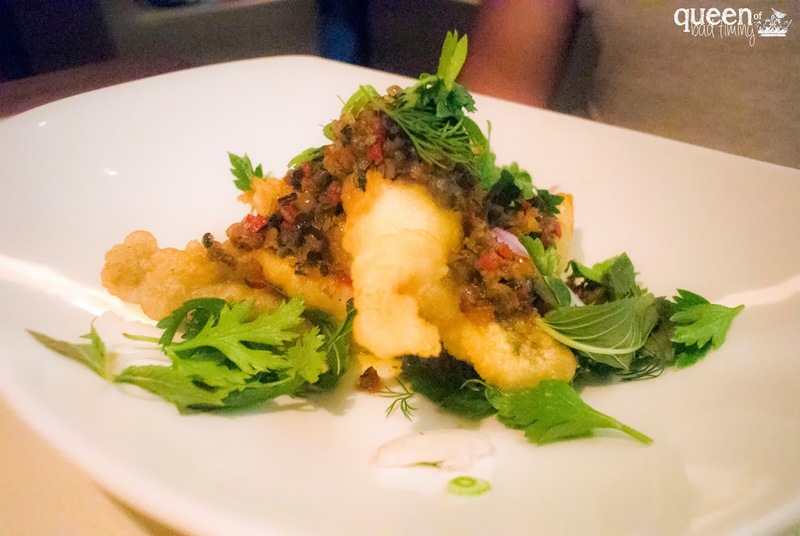 Jeremy’s main is the Crispy King George Whiting with Red Braised Vegetables and Herbs with Aioli ($45). The fish is flaky and slightly sweet; the batter light and crispy. The aioli on the side has the perfect consistency, and works well with the generous pilings of fish. 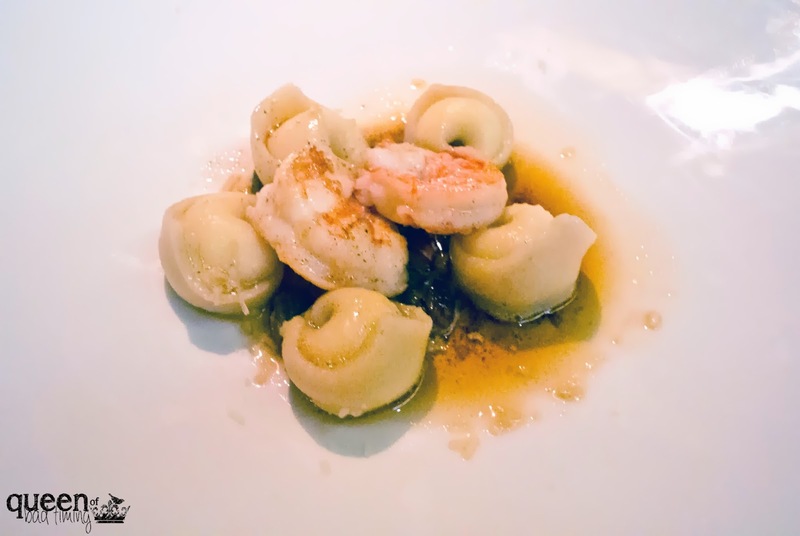 For my main, I selected the Seared King Prawns with Goats Cheese Tortellini, Burnt Butter, Pine Nuts and Raisins ($35). Our waiter tells me when we order that this is an entree dish but they can upgrade it to main. I actually decide to keep it at entree size because it’s late in the evening and I had known that I would be snacking on bread. The dish is delicious. Delicate, thin little tortellini pasta with the most delightfully creamy goats cheese inside. The burnt butter underneath is nutty and works well with the pasta flavours. But best of all are those perfectly cooked king prawns which are succulent, plump and just the tiniest bit translucent in the centre. I could have polished off many of these guys! I love the raisins too which are sweet and the perfect accompaniment to the cheese. We also order a side of Mac and Cheese ($9) though the charcoal oven roast pumpkin and sweet potato with burnt butter and garlic yoghurt sounded pretty tempting!! 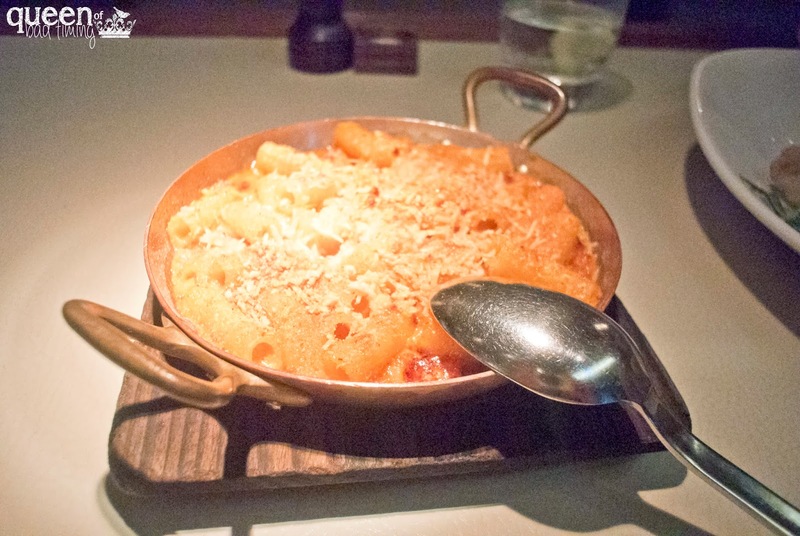 The mac and cheese is crunchy in some sections and soft in others. There’s so much sauce which is essential to stop it from drying out, and there’s a good level of smokey bacon throughout – so much so that the cheesy sauce has gone a little orange! While it’s not the best mac and cheese I’ve had before, I do enjoy the few bites I manage to get in before it all disappears. After we’ve finished our mains it’s nearly 11.30pm and we are exhausted! I have to admit it’s a bit of an internal battle as I try to decide if I want dessert or to go home and crash. While normally I can never say no to dessert, in the end I throw in the towel and admit defeat. I’m such a nanna sometimes but after being up so early that morning, I was definitely ready to head home – and I knew my boy was too (point proven when he fell asleep in the car on the way home). What a lovely spontaneous dinner to have on our date night. We’ve decided we’ll go back sometime hopefully soon and do it properly, with many courses and lots of wine to accompany. I can’t wait! That's what I love about Rockpool…it can either be an insane protracted meal or a blow in collection of snacks.